To learn more about OffHunting.com, please activate your browser's scripting option. 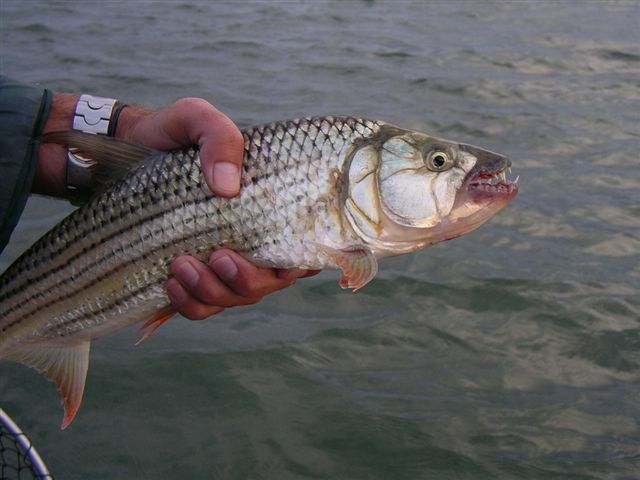 Tiger Fishing The Zambezi River has some of the best Tiger fishing in all of southern Africa. Our lodge is located on a remote stretch of unsettled land far from the general tourist areas. The fishing here is fantastic! 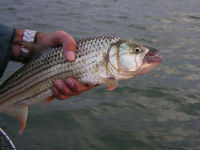 We have Tiger Fish, Bream, Cornish Jack and even Bottlenose. This section of the river boasts swift rapids and deep calm pools. The tigers come here to feed. Boats, expert guides and all gear are provided. After the fishing continue the adventure at the Seventh Wonder of the World - Victoria Falls. We have included a complete tour of the Falls as well as a sunset cruise on the upper Zambezi. Also how about a walk on the wild side with a group of young lions followed by an elephant back safari? Adventure awaits! This trip makes for the perfect end to any trip in southern Africa or can be extended to include more safari in Chobe National Park in Botswana. Day 1 - 01 September 2011 : Sidinda Island Lodge Your are received at Victoria Falls Airport and transferred to Sidinda Island Lodge. Sidinda Island Lodge is just over an hour’s drive from Victoria Falls and is situated within the pristine and unsettled Sidinda River Valley in Hwange Communal Land, on the banks of the Zambezi River. The Zambezi River in this rugged area is wild and fast-flowing as it rushes through a steep boulderewn gorge inhabited only by Klipspringer and Black Eagles. Day 2 & 3 – 02 & 03 September 2011 : Sidinda Island Lodge Early morning you board your boat for tiger fishing. The fishing along this section of the Zambezi is excellent and catching Tiger fish on light tackle in the rapids is excellent sport. Good bream fishing with Cornish Jack and Bottlenose being caught in deep holes! The lodge promote catch and release. Day 4 - 04 September 2011 : Victoria Falls After breakfast you are transferred by road, back to Victoria Falls and check in at the Victoria Falls Hotel. After check-in, you are met at the reception for a guided tour of the Seventh Wonder of the World – Victoria Falls, which is also a World Heritage Site. Victoria Falls is essentially a sheet of falling water about 350 feet high by about 5,700 feet wide. There are 4 major portions to the falls: The Devil's Cataract, Main Falls, Rainbow Falls, and the Eastern Cataract. The native name of the Falls is Mosi-oa-Tunya, which means "smoke that thunders". After this “wet & wonderful” (remember your head-to-toe waterproof) experience, you return to the hotel. Day 5 - 05 September 2011 : Victoria Falls An exciting day ahead! First thing this morning – A Lion Walk and Elephant Safari! Walking with Lions is a thrilling encounter that may prove a highlight of your Victoria Falls experience. During your lion encounter, the pride strolls freely through the bush and, after an initial safety briefing, you are free to walk with them, watching them interact, play, or even stalk prey species that they encounter. The Elephant Back Safari is an experience you will never forget. After being introduced to your elephant carer, you mount your elephant for a meander through the bush, viewing game from a wonderfully elevated vantage point. Your safari ends with interaction time with your elephant. All the elephants are rescued orphans from necessary culling operations in Zimbabwe in 1988. Although it is extremely difficult to train African elephants, these elephants have been lovingly and patiently trained to a high degree and are all very accustomed to humans and literally enjoy the interaction! On both lion and elephant safaris, there are opportunities to take close-up photographs of interactions with these magnificent animals. Late afternoon you board your boat for a sunset cruise! Sit back and sip your favorite drink and be part of the sundowner-culture in Africa! Apart from the great views of birds, hippo’s and crocodiles, the sunset will be something to die for! Remember to recharge all the batteries of the cameras before you go on this cruise! Day 6 – 06 September 2011 : Victoria Falls - Home You are transferred by road to Victoria Falls Airport, in time for your departure flight.